• Fold-Away legs. Perfect for that quick picnic on shore. • Inner Safety Shell. Funnels grease into front access grease tray reducing flare-up and heat discoloration. • 100% 18-9 mirror polished stainless steel. For lasting beauty and superior corrosion resistance. • Convenient Snap-out radiant plate. Allows quick, easy clean-up and perfect even heat distribution. • Oversized perfectly balanced lockable lid. Won't slam shut and secures all inner components for transport. • Full-length handle. Gives access from either side and makes mounting and transport easy. • Front access, lock-in-place grease tray. • Swiveling valve/ regulator. Allows quick and safe gas bottle exchange. • Magma offers the largest selection of mounting options and accessories. 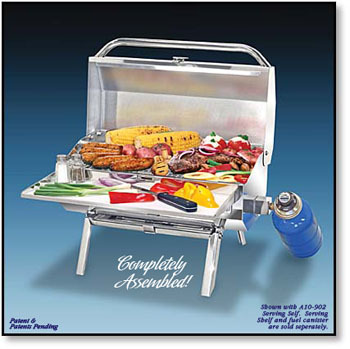 To customize your grill to your boat. Meticulous attention to even the smallest details creates the finest value grill available. 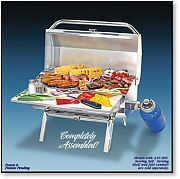 Wind tested for perfect even heat distribution, this grill offers the cooking performance usually only found in large back yard grills costing much more. Easily transported, the Fold-Away legs are out of the way on-board, but readily available for that quick picnic on shore. The Snap-out radiant plate provides easy access for clean up yet allows the flame kissed flavor that makes for really memorable meals on onboard or ashore. Designed for beauty and performance, you’ll find that the Chef's Mate is constructed flawlessly for years on dependable use. Uses standard disposable 1-lb. propane canisters or adapts to on-board LPG (propane) or CNG (natural gas) systems.